Last Friday the new Barnsley East MP Stephanie Peacock wrote in our local newspaper, the Barnsley Chronicle, that she was adding her name to the list of people calling for the rollout of Universal credit to be halted. I hadn't realised until then that it had being rolled out here, being lucky enough to have a husband earning a living wage. But this morning I saw a horrendous tweet from a local parish councillor referring to the benefit. 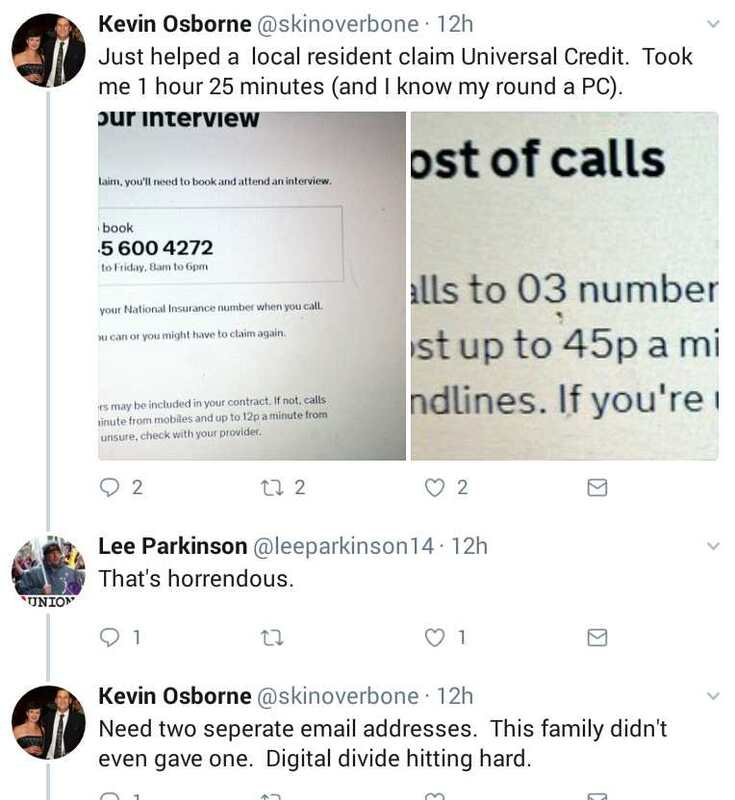 It seems that people must apply online, and at the end of that process (which took the councillor one hour and 25 minutes to complete on behalf of his non IT literate local resident) the person claiming has to ring a Premium rate phone number, up to 45p a minute, to book an appointment. What planet are the Department of Work and Pensions (DWP) living on? I am aware, from my own experiences in Barnsley helping with Adult Education IT classes, that a substantial portion of the population are unable to use a computer even if they were able to access one. I taught a range of people from young unemployed and women in their 30s who had a poor educational background to elderly pensioners who wanted to learn so they could keep in touch with family by email or Skype. Most of these classes now attract a high fee, only the very basic short course 'Computing for the Terrified' is still free to people on certain benefits. Even pensioners have to pay part or all of the fees for Adult Education classes following Council funding cuts a few years ago. I am 56 years old and learned to use a PC when my children started school in the 90s. But that was with the help of friends and word processing classes at Sheffield College, happily free to an aspiring young single mum on benefits. I still don't have one of those fantastical mobile phones, although I am writing this on a tablet computer connected to our wi-fi whilst lying in bed (the last few days I have been in a lot of pain, causing disturbed sleep and a higher than usual intake of painkillers). A significant number of people who attended school before the use of computers was widespread, let's say ANYONE OVER 40, will have no idea how to use one. Another few examples - I occasionally attend a local history group at Cudworth 'Resource Centre'. Or Library to the rest of us! The members of the group are mostly very elderly yet motivated, so a self-selected group of people more likely than others their age to try new things. They attend regularly for a chat and a cup of tea. Only three or four of the fifteen regular attendees ever use the group's desktop PC. After a lot of initial teething problems with the new Council wi-fi, which requires use of a mobile phone to get a code to log in, they manage to log the PC onto the web most weeks. A straw poll around the table earlier this year showed that about half the members had a mobile phone (but some of those did not carry them about) with a few having a tablet and wi-fi at home, usually set up for them by concerned children or grandchildren. The rest had no interest in modern technology, in fact some were vehemently opposed to its use. These people will, therefore, always require help to access online facilities. Recently a drop in day was advertised at the Library (Resource Centre pah!) for people wanting to learn more about Council online services. I turned up and found no actual advisors in attendance. I was directed to one of the library PCs to fill out some kind of form! Nearby was one of our Councillors who had also attended expecting to be shown the ropes by a real person. What use would that session have been to most of my history group colleagues? And yet access to many Council services is now only available online. Don't even get me started about ordering a new bin when yours has been stolen! To top it all the Benefits Advice service has just been closed in Cudworth Library! I hope they are not just referring people to Citizens Advice, because they are already swamped with work. Finally - In order to allow the history group members to participate in a consultation exercise about the Library last year I had to ask the staff for paper forms. These should apparently have been readily available, in fact I had to beg for them from staff who had been told to only hand them out in exceptional circumstances. People were expected to book a session on one of the Library computers and fill in the online questionnaire. If they could have been persuaded to do this, not at all a given, it would have taken me hours (or days!) to coach twelve people to have the skills to answer the questions online. As it was they filled in the forms during the tea break of their normal meeting and then went back to business happy that they had been able to have a say in the consultation. I know that older people are not (yet) required to apply for Universal Credit, but many of the problems I have described will apply to younger educationally disadvantaged people like those I met whilst helping at the Adult Education classes. Consider too, that to have turned up and enrolled at an IT class requires firstly knowledge of the classes' existence, the confidence to apply and self-motivation to attend, let alone overcoming the cost implications. So those people I met were the tip of the iceberg! I was inspired to write this post by reading this post on Twitter a couple of hours ago. Kevin is going to keep tabs on this family's claim and see how long it takes them to actally receive a payment. It is a disgrace. 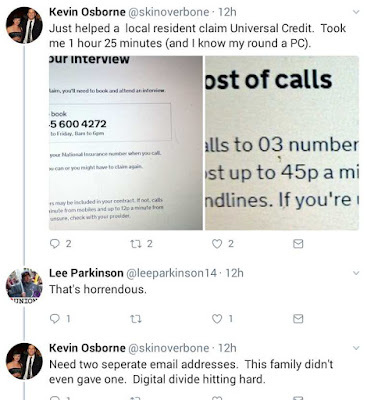 We need to keep supplying MPs like Steph and councillors like Kevin with more examples of the shambles our benefit systems are in so they can continue to fight for us.